SAST, IAST, DAST, MAST, *AST – There are plenty of technologies and ways to test your software, but how do we do that without slowing us down in a rapid development environment. 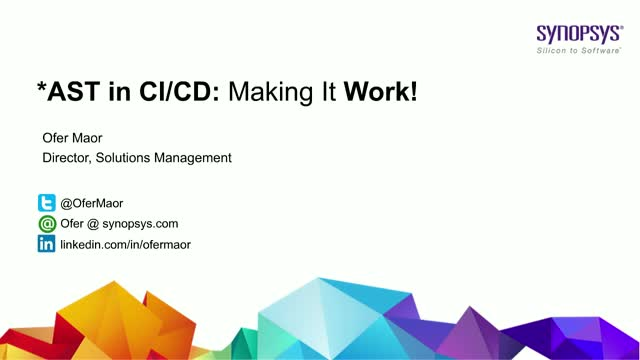 In this session we will give practical advice on how to integrate software security testing into your CI/CD and your development process so it works. The session will review the pros and cons of each of the testing technologies, how to adapt it to rapid development, and how to make testing work as organizations are moving to A/B testing. Finally, this session will guide on how to manage the balance between risk and speed to build the right process, so that real threats will become blockers, but other issues will be handled in a parallel, slower cycle, without slowing down the main delivery.